Throughout the years I have had some wonderful opportunities to review tons of movies from a variety of studios. Over this time I have gotten to know what to expect from each "brand". One of those has been Hasbro Studios, however, this next review I never saw coming from them. When I hear Hasbro, I think of My little Ponies and Littlest Pet Shop. I of course also think of games of different varieties. When I was asked to review the newest DVD released on July 15th, 2014 from Hasbro Studios, Clue A Movie Mystery Adventure, I thought of something completely different than what arrived. The synopsis says "Clue: A Movie Mystery Adventure features the beloved characters inspired by the world’s most famous crime-solving board game, Clue. Follow six very different young sleuths as they embark on a mysterious adventure beyond their imaginations. As they work as a team to discover hidden treasures, decipher cryptic knowledge, and uncover a secret society, they learn they have more in common than they thought." Dane was actually the one quite interested in this film. He watched it the moment it arrived and I caught quite a few bits and pieces of it. I had assumed this was going to be old style film, kind of classic murder mystery. I was wrong as the movie had newer (younger) actors as well as more of a modern day twist on the classic game. Dane not only watched this several times right away, but he made it a movie request that every one he pretty much knows watch it as well. He really enjoyed the story line as well as the younger characters and it was more of an older kids movie, so he enjoyed feeling a bit like his big sister. Recommendation: I thought it was cute and Dane definitely enjoyed it. I'd be interested to see if Alana enjoys it when she returns home. This way I would have a better idea of an age group. I think for $13 it was worth the purchase if you have a child interested in these types of mystery stories. 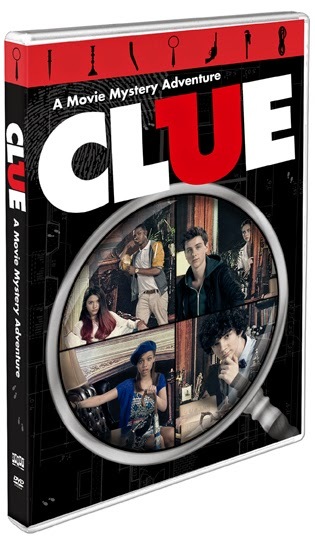 Giveaway: Shout Factory is going to give one of A Lucky Ladybug's lucky readers a copy of Clue A Movie Mystery Adventure on DVD of their own! I always loved playing the game so this sounds interesting! I was usually very good at figuring out the game, and I was often accused of cheating (this happened to me a lot with games growing up). I never cheated, I was just good at board games! I used to play Clue with my sister. That would be a good one to have and play with the kids. I loved playing clue! I always tried to cheat!!!!!! My family and I absolutely love Clue! We play one of our many version of the board games every other weekend. We even have a VHS game and love the movie as well! It is hard for me to pick out just one memory, but I believe this DVD could create many new great memories with my family. I love the layout of your blog with the four leaf clovers! Of course we played Clue and all of us girls wanted to be Miss Scarlet! I grew up playing Clue and could not wait until my kids were old enough to play with us. We love the process of sorting out who when and where. Clue is one of our favorite games! We like to act out personalities for each of the characters. My brothers and I use to play the game Clue all the time when we were kids, loved that game! I loved playing clue as a kid. My sister was always Colonel Mustard and I was always Professor Plum. I played when I was younger, then my boyfriend's son had a newer version on the game and like them both. I used to play it all the time..Loads of fun! I have only played Clue one time and it was a lot of fun, my DIL is a whiz at the game. We so enjoyed playing clue. We would play it almost every week during family night. The game is great. I always liked Colonel Mustard. I've actually never played Clue before! Yes I love playing clue my oldest son has started playing with my husband and I too. I have played clue. I remember it being too complicated for me as a kid. Yes we play it all the time. My daughter is a huge fan of it. I haven't played clue in ages. We used to play this a lot with my friends and we always would enjoy ourselves. No special memories stand out though. I love the game clue!!! Used to play it all the time growing up!! i love playing clue.. i always pick the same scenarios every time. I'm sorry but I don't like your blog design. I dislike all the green color and the large ladybug. Sorry but it is disconcerting to me. I have never plated Clue but it sounds like fun. Loved playing Clue as a kid. Loved Mrs Plum and Colonel Mustard. I think my grandson is just about old enough to play now! I used to love playing clue, but it has been a long time since I played! Actually no we did not play clue we never did own the game some liked it some did not! I love Clue the board game and I played it a lot as a kid.